SIESTA KEY, Fla. – The Florida State Beach Volleyball team recorded two wins on Sunday at the 7th annual Fiesta on Siesta Tournament as the Seminoles (20-1) defeated No. 20 Florida Atlantic, 5-0, before closing out the day with a 5-0 victory over UNC Wilmington. The Seminoles’ No. 1 duo of Julie Brown and Jace Pardon went a perfect 4-0 on the weekend, defeating FAU’s Gabrielle Dischler/Delaney Clesen, 21-13, 21-12 and UNCW’s Nicole Lott/Kristen Powell, 21-10, 21-13. On court two, Kristina Pellitteri and Victoria Paranagua also remained perfect for the tournament with victories over FAU’s Chelsey Tekavec/Andrea Galinis, 21-15, 21-7 and UNCW’s Bella Borgiotti/Katie McCullough, 21-10, 21-8. Florida State’s Vanessa Freire and Sierra Sanchez battled FAU’s Heather Weiss/Ashlan Cunningham in the first set, winning 23-21. Freire/Sanchez won the second set, 21-11, for the victory. Against UNCW, Kayla Joyce and Annie Montgomery took over on court three and defeated Maddy Kline/Ashleigh Crutcher, 21-17, 21-19. Joyce/Montgomery also defeated Florida Atlantic’s Brittany Pellitteri and her partner Julia Lewkowicz, 21-12, 21-15 on court four. 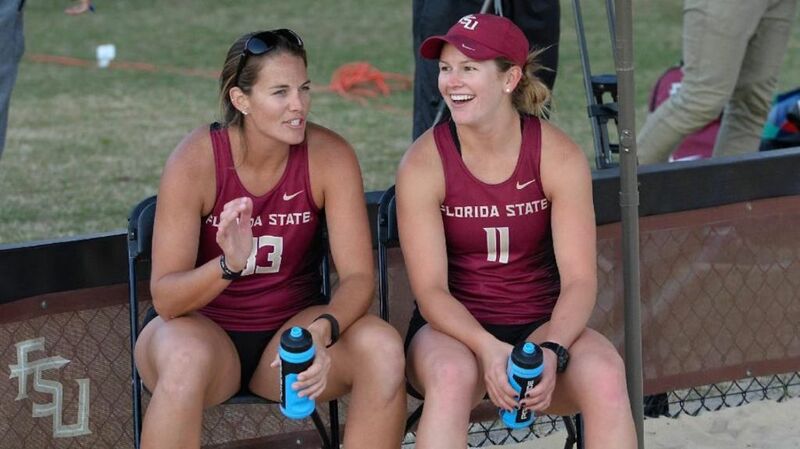 Brittany is the younger sister of Kristina and former Florida State beach volleyball player Stephanie Pellitteri. On court five, Nikki Esposito and Katie Horton defeated FAU’s Natalie Faley/Nicole Grant in three sets, dropping the first set 17-21 before rallying for to win 21-15, 15-9 in the second and third sets. Against the Seahawks, Horton teamed with freshman Brooke Kuhlman for a 21-13, 21-13 victory over Sydney Alvis/Sarah Kelly on court four. Meghan Conway/Ali Eager defeated UNCW’s Bethany Gesell/Halle Hunt, 21-12, 21-14 to close out the weekend. Florida State and Florida Atlantic had previously been scheduled to play in Deland, Fla., at the Stetson Beach Invitational on March 26, but the match was cancelled. Florida State returns to action on Friday & Saturday, April 15 & 16 as the Seminoles host their first tournament of the regular season welcoming five other schools to Tallahassee for the FSU Beach Invitational. A full schedule of the tournament can be found on Seminoles.com. Match 20 – Siesta Key, Fla. Match 21 – Siesta Key, Fla.